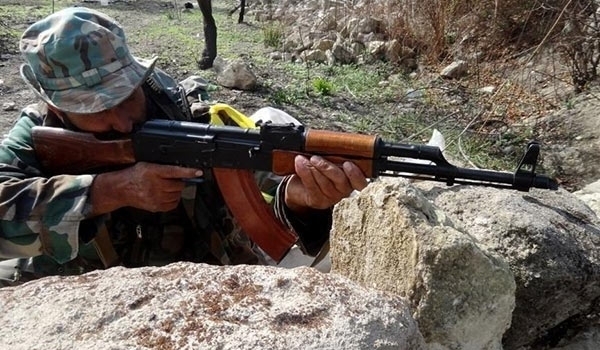 The Syrian army killed a ringleader of a terrorist group affiliated to the al-Nusra Front in military operations in Idlib province. Khaled al-Baharai, a senior commander of an al-Nusra-linked terrorist group, was killed by the Syrian army in the Western neighborhood of Khan Sheikhoun city in Idlib on Tuesday. Al-Bahrari was among six terrorists who were killed in the military operation. Earlier on Tuesday, the Syrian army announced that the country’s fighter jets carried out many combat sorties over the terrorist groups’ positions in the province of Idlib. The Syrian bombers targeted the militant groups’ military sites and defense lines North of Khan Sheikhoun in the Northwestern province of Idlib, which claimed the lives of many militants and destroyed their military hardware, the army said.